Any type of hardwood or softwood species that is at least 1” in diameter can be used to create mulch for your garden or landscape. 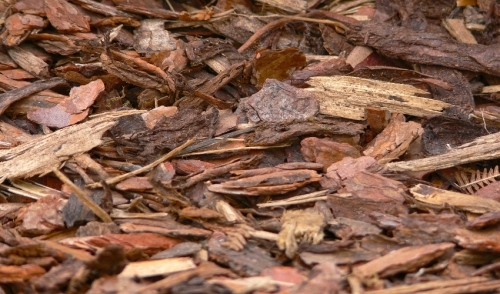 To make wood mulch, you will to need to rent the proper equipment to get the job done. The proper equipment you need is a portable wood chipper/shredder. Every chipper/shredder is different, but will come with specific instructions to follow. In general, it is just a matter of feeding your debris and tree limbs in the machine and watching wood chips pop out the other end for mulch. Chippers/shredders are rated based on the maximum diameter they can withstand. Before beginning your project, make sure you have the right one. Some of the more popular brands include Bandit Industries, Vermeer, PowerTek, Rayco, Mackissic Inc. and Eliet USA. Smaller models are only useful for grinding wooden branches up to 2-3” in diameter. If you are looking to chip larger pieces of wood up to 6” in diameter you will need to rent a larger model. If you are a professional and are looking to grind tree trunks, this will require a large industrial chipper mostly operated in warehouses or by tree and landscape companies. All models that you can rent will feature a heavy-duty cutting wheel for persistent production and reliable operation. When renting a more compact chipper/shredder, try looking for ones with two wheel trailer mountings to provide you with easy towing and better maneuverability in confined spaces. If you are worried about mess or clean up, be sure to rent a chipper/shredder that includes a bagging system attached to the discharge chute of the machine. The price and availability of renting chippers/shredders vary from store to store and by location. In general, you can rent a chipper/shredder from any local hardware rental store or privately owned lawn equipment retailer. Some rentals will also require you to use a vehicle with a trailer hitch so be prepared in advance. Chipping for mulch is always a good idea to not only clean up your lawn, but also add beauty to your landscape. It is the perfect DIY project for anyone looking to save money on quality mulch grown right in your backyard. All you have to do is rent a chipper/shredder and you have the equipment you need to create a quality landscape for your home.